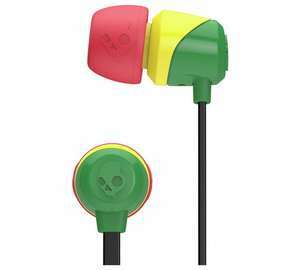 I bought the Rasta one's but everytime i put them into my ears they keep jamming................no...........i'l get me coat. Picked up a pair yesterday and they are better than I expected for £4, better than I expected for £10 even. The rasta ones have only two pairs of bud covers while the other colours have three. I have a pair of these I picked up a while back in another sale, they're a bargain at £3.99! Although I would never spend big money on in-ear headphones, if I want qaulity I'll be spending it on some cans. Sadly these are not going to be music to my ears! They are all sold out near and far from me.... Meowed! Jib? Short for jibber? Hand jibbers for all. Better not might get called out for cultural misappropriation. Theses are truely awful. Got a pair last week, hurt my ears so much. Very nice headphones. Tangle free and fits nicely. I own the same ones in different style/colour. I find them very uncomfortable unfortunately. Hurt my ears after a while and they always tend to fall out. Not the best sound either BUT I’m giving heat as they’re cheap and will always come in handy as a backup etc. Cureently listening to music using a pair of these same headphones. I'm actually really pleased with the sound quality. Better than some JVC ones I bought a while back (I think they were Xplosives). Really clean sound, decent bass. V.good for the money. The black one is much better than the colourful one! I agree black is always smart, pity Apple doesnt think so. Do these stay in well though. I agree black is always smart, pity Apple doesnt think so.Do these stay in …I agree black is always smart, pity Apple doesnt think so.Do these stay in well though. haha It is worthy to pay an extra £1, for me. My youngest is going on holiday before xmas and the Rasta coloured ones will fit in perfectly to where she is heading to......which is where for a bonus point?